I enjoy playing for appreciative, listening audiences in folk clubs, concert halls and festival stages and I especially LOVE playing house concerts! 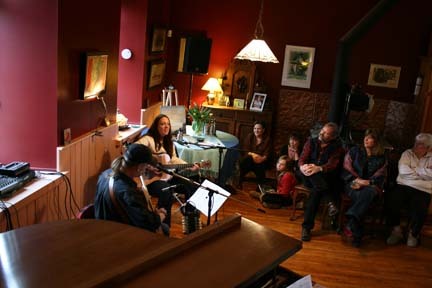 If you'd like to host a house concert but aren't exactly sure how to go about it, or maybe this is the first time you've ever heard of a house concert and would like to know more ~ please read on! Essentially it's a concert in someone's home; usually in his or her living room. You'll need a space that holds 25 or more people. That means you might have to rearrange the furniture a bit; possibly rent or borrow some folding chairs and simply set 'em up so everyone has a good sight-line of the artist you've booked (and hopefully that's me!). Try to choose a date that doesn't conflict with major sporting events or baby christenings and you're off to the races. Then enthusiastically tell all your friends and neighbours and explain all the proceeds go to support the work of the artist. Generally a $20 ticket price is standard. If you wish to keep a small % of the proceeds to help offset your own expenses such as chair rental fees, make sure you arrange this at the time you hire the performer. Have you ever thrown a party and wondered the night of, if anyone was actually planning to come? Though sometimes challenging, by requesting advance payment the stress of the unknown will be removed from your to-do list. Concert night everyone will rest easy, performer included, and you will all enjoy the evening’s magic. Invite your guests to bring along a beverage of their choice and a small hors d'oeuver contribution to share at intermission. Performing and selling merchandise is often an artists only means of financial security. Encourage your guests to visit/shop at the CD table and invite them to take home an autographed souvenir, for themselves or to share with friends and family. They're guaranteed to meet some new friends and enjoy an intimate musical experience they'll definitely want to tell more friends about! And don't forget to put a 'guest book' out for your guests to sign... collecting positive comments and compiling an email list will help motivate you to host another incredible concert in your own home. "We had a fantastic night!! Really enjoyed it. 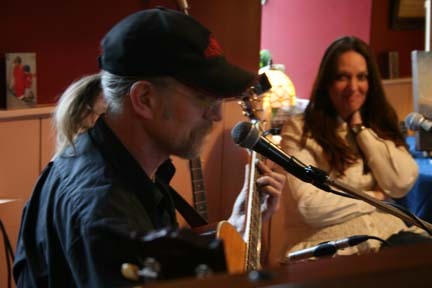 My energy was fantastic today thanks to an amazing night of acoustic music." Cheers Andy.